My husband absolutely loves ribs. He loves having the bbq sauce all over his hands and is known to leave a little on his face just to get a rise out of our waitress when he orders them when we’re out to eat. He takes his ribs seriously. Every time he makes sure to remove his wedding ring and gives me a grin that says, “It’s time for me to go to work so watch out.” He’s never really found a recipe outside of a restaurant that he enjoyed until we visited close friends of ours, the Tuccis. 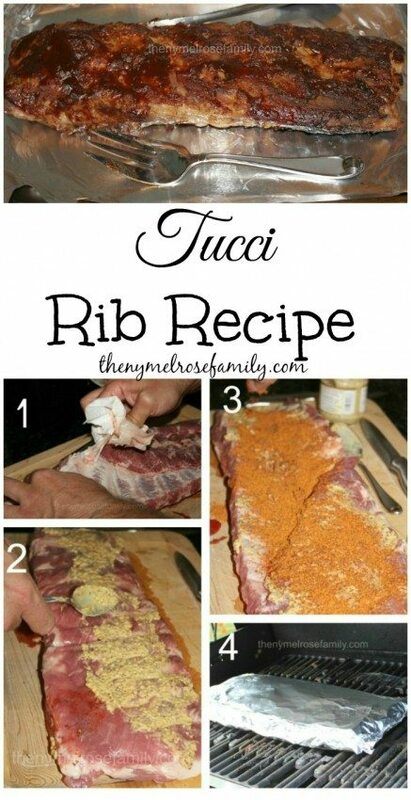 Their rib recipe is out of this world! p.s. the new blog design looks great! Sounds great and easy. And I like the idea of putting them on the BBQ rather than heating the whole house up with the oven (which is what I usually do). Slow roasting the ribs ahead of time is the key to tender ribs in my opinion. I used to boil them, but I didn’t like the way the meat turned out. Roasting gets them all juicy and tender. I’ll be trying this mustard method too. My husband loves ribs, too. These look so good! I agree – slow roasting makes them so fall-off-the-bone delicious! We’ll have to try the mustard and seasoning rub next time.